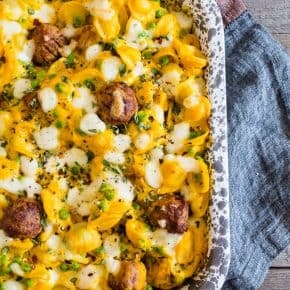 This pumpkin cauliflower alfredo meatball pasta bake is ready in under 30 minutes and packed full of delicious flavor. 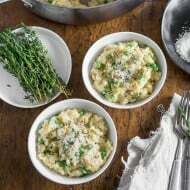 It’s the perfect fall dish and you’ll love how easy it is to throw together! This is a sponsored post written by me on behalf of Cooked Perfect® Meatballs. All opinions are 100% mine. It’s comfort food season. As much as I LOVE summer and all the fresh produce it brings I’m always secretly happy when fall shows up. 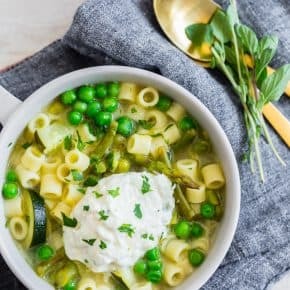 I open up my windows, make soup at least once a week and crave all the things warm and comforting. Plus, since I live in oversized sweaters in the fall and winter I can consume all the carbs. Well, don’t tell my trainer that. She’ll disagree with you. I guess what I really mean is that I get to eat all the carbs in moderation. 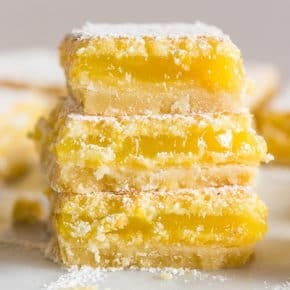 Hearing my trainers voice in my head helped me come up with this recipe. I knew I wanted to make a baked pasta and I was craving alfredo sauce but alfredo sauce is just loaded with fat. Listen, I might indulge every once and again but I wanted something super creamy that wasn’t loaded up with butter and cheese. I have made cauliflower alfredo sauce before but this time I threw in some pumpkin for added fall time flavor. 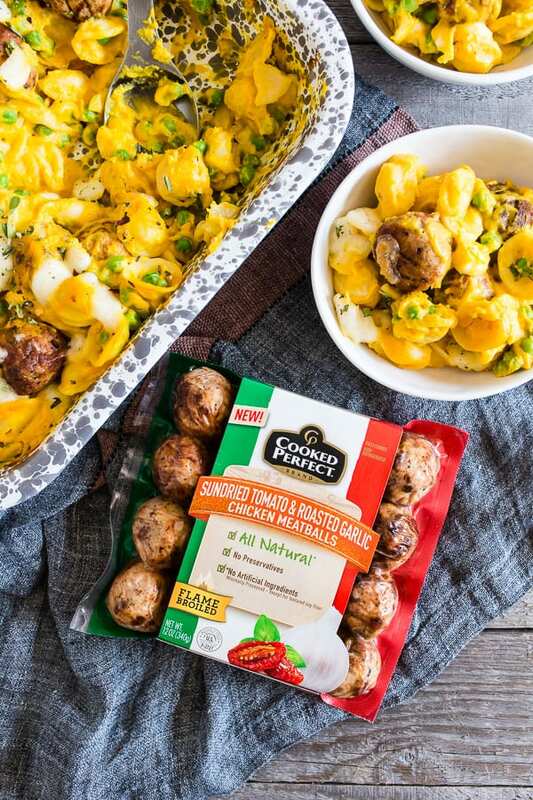 Plus, I knew these flavors would pair awesomely with the Cooked Perfect® Sundried Tomato and Roasted Garlic Chicken Meatballs I used in the dish. Have you given these meatballs a try yet? They come in 4 delicious flavors (Italian Style Beef and Pork, Korean Style BBQ Beef and Pork, Sundried Tomato and Roasted Garlic Chicken and Italian Style with Parmesan and Mozzarella Chicken) and are already pre-cooked so they are ready in no time! Plus they are flame broiled to lock in all that meaty flavor and made with real cheese and herbs. Trust me, no one will know you picked these babies up at the store! 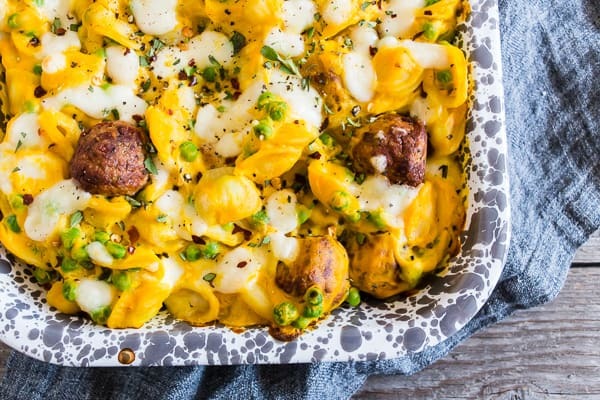 For this pumpkin cauliflower alfredo meatball pasta bake dish, I made my homemade pumpkin cauliflower alfredo sauce and mixed it with one package of Cooked Perfect Meatballs, frozen baby peas, pasta and just a touch of fresh mozzarella cheese. SO EASY! 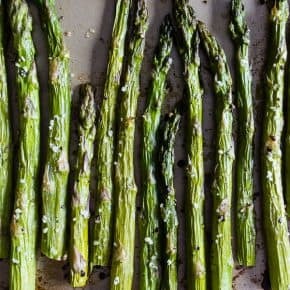 And it’s ready in under 30 minutes and is the perfect dish to sneak in extra vegetables. 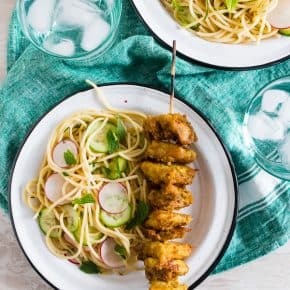 It turned out so creamy and dreamy and 100% for the busy weeknight rush. Find Cooked Perfect Fresh Meatballs in the refrigerated meat & poultry section and be sure to check the store locator before you head out to make sure they’re in your area. Also, Save $1.00 on Cooked Perfect Fresh Meatballs. 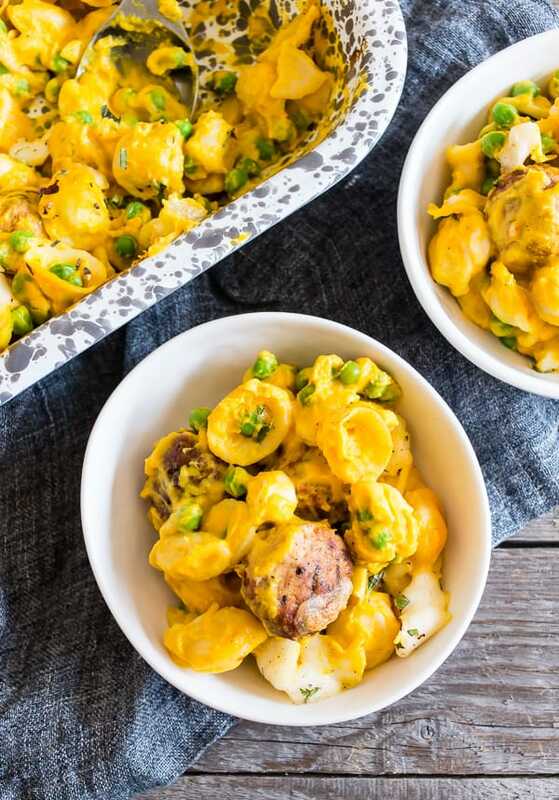 This pumpkin cauliflower alfredo meatball pasta bake is ready in under 30 minutes and packed full of delicious flavor. 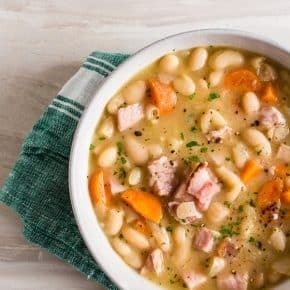 It's the perfect fall dish and you'll love how easy it is to throw together! 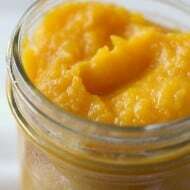 In a high-powered blender add steamed cauliflower, pumpkin puree, milk, parmesan cheese, garlic and kosher salt. Blend on high until smooth, about 3 minutes. While the sauce is blending add a medium-sized pot full of salted water to the stove and set over high heat. Once the water is boiling add in the pasta and cook until al dente, following box directions. When the pasta is cooked, drain and add back to the pot. 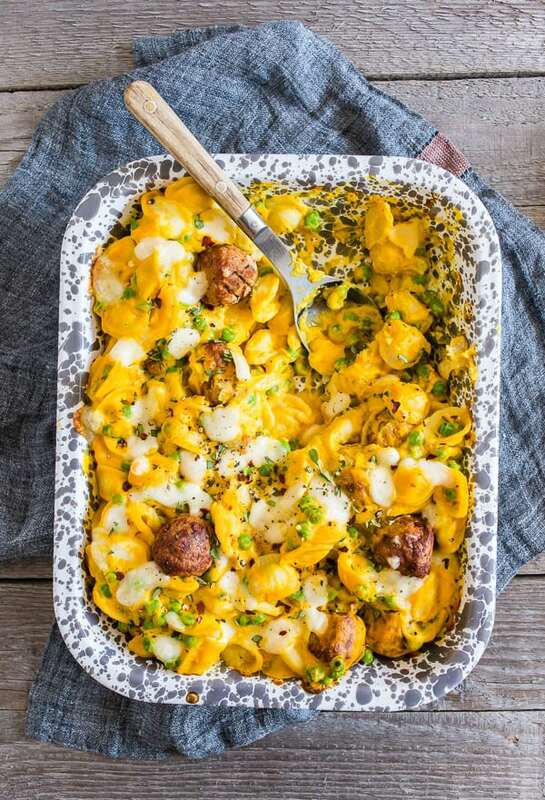 Stir in pumpkin cauliflower alfredo sauce, frozen peas and meatballs. Stir to combine. 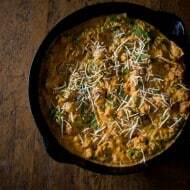 Add pasta mixture to a 9x9 casserole dish and top with cheese. Bake for about 15 minutes or until the pasta is warmed throughout and the cheese is melted. 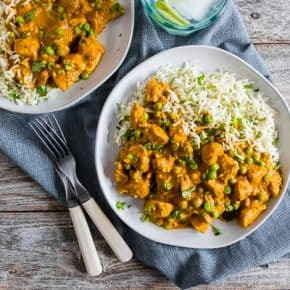 I’ve been wanting to try a savory pumpkin dish and this looks fantastic! Meatballs are always a hit in my house! Such a fun way to use pumpkin!! What a delicious dish! I love all of the flavors. I also love the convenience of the pre-made meatballs! I would love to have this for dinner! I love everything about this dish: the cauliflower, the pumpkin and of course, the meatballs! So much flavor! Cooked Perfect meatballs are really good! 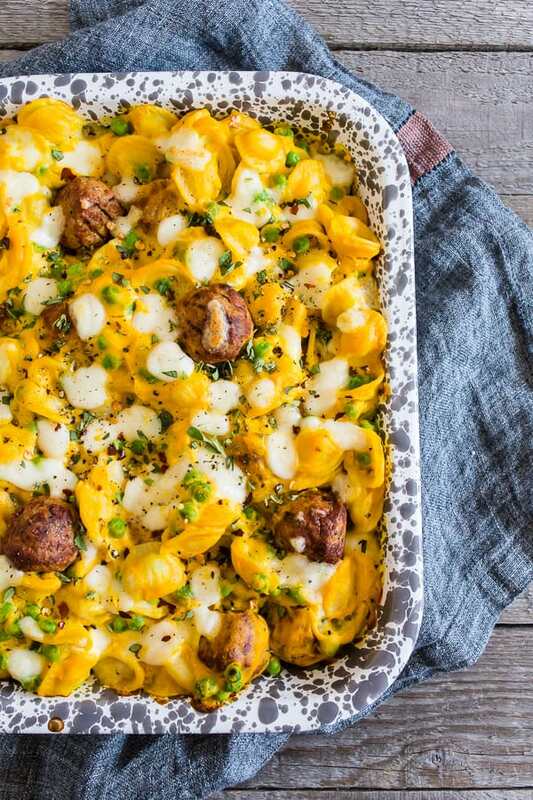 And I love this pasta bake…so perfect with the flavors of fall! I’m enjoying pumpkin season while I can! This is just so perfect for fall! I know my kiddos would love it! This sounds so interesting. I love how you combined the cauliflower with the pumpkin for this unique dish. I bet it’s so tasty!